BOOK all 12-cabins aboard the luxury motor catamaran Haumana in Tahiti for family, friends, club-mates or the company, and you'll not only have Haumana to yourselves, you can rename her whatever you like while you're aboard. Haumana carries just 24-guests in her 12-cabins as she sails 3- or 4-night cruises – or a week with both these options combined – across the extraordinarily beautiful Rangiroa Lagoon in the Tuamotu Archipelago. 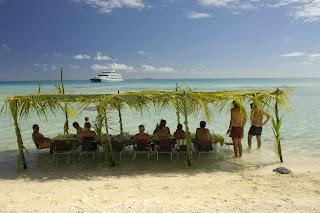 Guests who choose to charter can also fly their own flag during their unique holiday, that includes all crew, all onboard dining, at least one 4-star French beach picnic at shady tables set up in the shallow waters of an uninhabited island, wines with lunch and dinner, and all soft drinks throughout the cruise. Activities can include fun fishing tournaments, beach games, watersports and snorkelling competitions to identify fish species, corals and other marine life, and escorted beach- and bush-walks. If you'd like to give Haumana a try before going for a full-yacht charter, Coral Seas Travel have 3-nights costing from $5349pp twin-share and 4-nights from $5929pp twin-share, including return air and taxes from Sydney, transfers in Tahiti, 1-night pre- and one post-cruise at the Radisson Plaza Resort in Papeete, all meals, wines with lunch and dinner and non-alcoholic drinks.